Mayor Rahm Emanuel called for nothing less than complete and total reform of the law-enforcement system. CITY HALL — In the midst of a growing controversy resulting from the Laquan McDonald shooting case, Mayor Rahm Emanuel told the City Council in a speech on police accountability Wednesday that nothing less than complete and total reform of law enforcement was called for, and he pledged to deliver it. "I'm the mayor. I own it. I take responsibility for what happened because it happened on my watch," he said, at times his voice cracking with emotion. He said repeatedly, "We have a trust problem" between the police and public in Chicago and vowed, "We're going to fix it." Emanuel called for "nothing less than complete and total reform of the system." Ald. 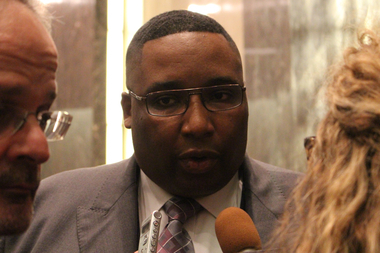 Jason Ervin called the mayor&apos;s speech "a good first step." "The first step in that journey is my step, and I'm sorry," he said. Emanuel said he was with a group of young men last weekend, describing them as all having "a history with the criminal-justice system," but "trying to get on the right path, do the right thing." "And the answer is no," Emanuel said. "And that is wrong. And that has to change in this city. That has to come to an end now. No citizen is a second-class citizen in the city of Chicago." Emanuel called for a three-prong approach to reform, covering the justice system, police culture and community involvement. He addressed how the Independent Police Review Authority had been created in 2007 only to "ask why, out of the hundreds of police shootings in the last eight years, only a handful of them have led to any charges?" The mayor said, "It is my deepest hope that we continue to address these issues in a peaceful, passionate and productive way, but I fully understand that the public's patience is limited. You want answers. You want corrective action. You deserve both — and you will get both." Later, he added, "We have to be honest with ourselves about this issue. Each time when we confronted it in the past, Chicago only went far enough to clear our consciences so we could move on. This time must be different. It will be a bumpy road, make no mistake about it. It is a painful process, and a long journey, but we will not hesitate in pursuit of what is right." During his speech, the mayor recounted the night in October 2014 when 17-year-old McDonald was shot by officer Jason Van Dyke, who was responding to a report of a man with a knife who had been breaking into cars. The shooting, at 41st Street and Pulaski Road, "never should have happened," Emanuel said. "A young man with a knife, agitated, surrounded by police officers. And until that point, where police officer Jason Van Dyke got onto the scene and got out of his car, this was a routine situation. It could have, and it should have, been contained and managed. Situations like this are diffused and resolved all the time without the loss of life, which is why we never hear about them. The majority of our officers do their job professionally every day. "But 30 seconds after officer [Van Dyke] arrived, it was anything but routine or by the book. Sixteen shots were fired. A young man from Chicago died in the streets of Chicago. Nothing, nothing can excuse what happened to Laquan McDonald," he said. Addressing the police force, Emanuel said, "We cannot ask citizens in crime-ravaged neighborhoods to break the code of silence if we continue to let a code of silence exist in our own police department. Respect must be earned. Respect is a two-way street." 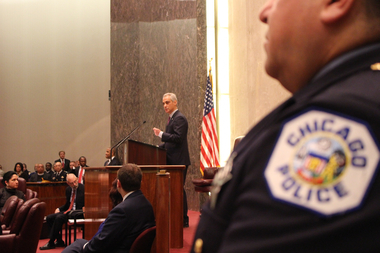 The mayor's press office described the speech as part of Emanuel’s "ongoing efforts to build stronger bonds of trust between Chicago police and the communities they’re sworn to serve." RELATED: Poll shows about half want mayor to resign. Emanuel's aim in the speech was to "lay out a path forward for restoring trust in our police department," the mayor's office said in a prepared statement. Emanuel touted recent actions to address the unrest following the release of the video showing Van Dyke shooting McDonald. Changes included firing Supt. Garry McCarthy, expanding the police body camera program, appointing Sharon Fairley as the new head of the city’s Independent Police Review Authority, and vowing to cooperate with a U.S. Department of Justice investigation into the police department. On the latter, he told the City Council, "We welcome it. We will be a better city for it." The city has paid more than $500 million in police-related settlements since 2004. Emanuel has been embroiled in the controversy since before the police dashcam video of McDonald's shooting was released to the public ahead of the Thanksgiving holiday. As the U.S. Department of Justice moved to launch a civil-rights investigation of the Police Department this week, aldermen called on the probe to be expanded to the Emanuel administration, while seeking a formal hearing into "what they knew and when." An amalgamation of protest groups were set to stage a citywide walkout to demand the resignations of Emanuel and Alvarez anew at noon Wednesday at Daley Plaza.